During this season of thanks and of giving, please give extra consideration to "the least of these" and give them The Gift of Mobility. "Last week at Neema Crafts, we called 40 people with disabilities from far and wide across the Iringa region to attend a special presentation ceremony of PET carts. We invited the Regional Commissioner, local radio and and newspapers as well as the Chairman of the regional ‘Chama Cha Walemavu’- the govt. department for disability. Some attending (like Ayub, left) had never before had any form of personal mobility and had always had to rely on members of his family to move him around. "There was an air of joy and excitement in our conference room, as people arrived one by one (some from many kilometres away) and we shared sodas and popcorn together. The presentation began by welcoming everyone to Neema and explaining the work of the centre. "Time was then spent explaining exactly where the PET carts had originated and we even showed pictures of the construction team in Minnesota. There was a large round of applause when we said that these trikes had been donated and shipped for free by Easter and Trinity Lutheran churches! "Haruna our disabled ‘fundi’ (or technician) was on hand to explain the important features of the bikes, what could be adjusted and how to use the brakes etc. We then emphasised how to stay safe on the road, after which the SHIVYAWATA Chairman spoke with great enthusiasm about this chance to meet together and show solidarity with other people with disabilities from across the region. "Finally, it was time to distribute each of the carts. There was quite some interest from passers by and guests in our restaurant as they saw all of these carts being presented. "The best moment for everyone I think was when we all set out on the road for a parade through town, around the large fruit and veg market, past the police station and post office and then on for a final huzza in the park." "Give them a chance, and people with disabilities will help to assist in development of the country at many levels of our societies. 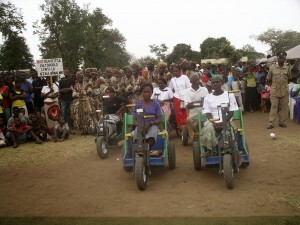 Seen here are some disabled men and women who recently joined their fellow members in Salima at a road show 4km long to the venue of this important function which was organized by the National Initiative for Civic Education. "As part of its special needs work, Orphan Voice in Vietnam partners with The Personal Energy Transportation Project to distribute hand-propelled carts to those who need them. An Orphan Voice worker noticed Van as he walked on his crutches along the road. She struck up a conversation with him, told him about the PET carts and urged him to fill out an application. He was glad to do so." November 12, 2014 — This week, Father Felix from the Centro Medico San Benito José Colonia Francisco Morazán was able to finally deliver a long awaited PET cart to Noah, a young man needing mobility in Comayagua, Honduras. The PET Mobility Project would like to thank all who were involved in this Gift of Mobility. October 24, 2014 — For five years, volunteers in Bryan built nearly 1,700 carts for handicapped people in third-world countries where terrain isn't forgiving to wheelchairs. But many of the volunteers had never met the cart's recipients until Friday. During a lunch at the First Methodist Church in Bryan, Seun Oke, a 27-year-old from Nigeria, thanked the 200 volunteers in the room for changing the lives of people like her through the carts. More than 70 million people worldwide are leg disabled due to birth defects, disease and casualties. Without assistance, they must crawl and use other undignified means to get around. The PET® Mobility Project provides these children of God with hand cranked Personal Energy Transportation carts, vehicles that allow them to go where ordinary wheelchairs won’t go. There is no cost to the recipient – we reflect the love of God by giving them the Gift of Mobility. Since 1994, over 48,000 PET® carts have been built by hundreds of volunteers at 24 Affiliate workshops and distributed in 100 countries with the help of 49 distribution partners. The PET® Mobility Project would like to say Thank You to the many who have given their time and resources to enable the Gift of Mobility to reach those in need.